We have served customers from almost every industry. The majority of our users are from the Oil & Gas, Financial and Education industries. Getting data from a PDF table into a usable spreadsheet is a big hassle, and we're on a mission to make it effortless. Using the PDF Tables cloud converter, you can simply upload a PDF file and download it as a structured spreadsheet! 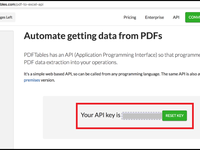 We also have an API available, meaning you can integrate PDF conversion into your current processes. The API can be called from any programming language. We also offer Enterprise on-premises solutions, get in touch to find out more. PDF Tables Reviews Recently Reviewed! Pros: We have many machine learning models which requires ton of data. We get data in pdf and pdftables convert those tables into csv format which can be directly put in our models. It also converts them to xml files which we read in our application code for client. We are pretty happy. Cons: Not many features other than basic pdf converting. Messes up sometimes in colored pdfs. Hope to have some api to do bulk processing in parallel. Thank you for the review, we're glad you are happy with our product. 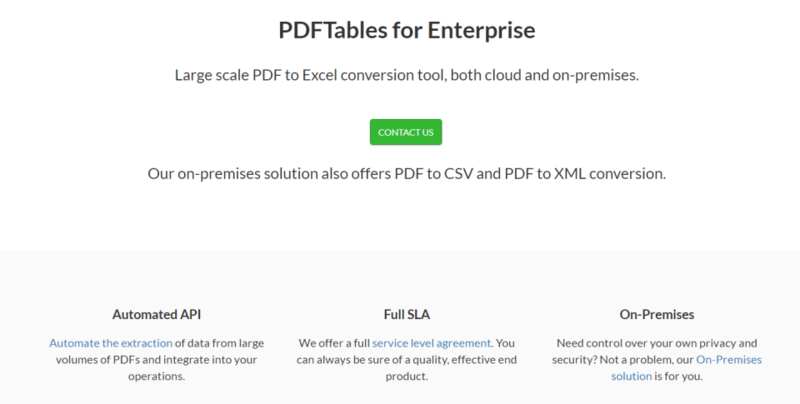 We do infact have an API available (cloud and on-premises) which will enable you to do bulk processing: https://pdftables.com/pdf-to-excel-api. Regarding the coloured PDFs - PDFTables does not pull through formatting upon conversion. We focus on extracting the tabular data efficiently and accurately. Pros: This is the best definition of software which does what it says. You have a table in pdf, you have tried it copying in word or excel and you can't do it properly. 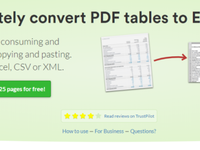 PDF table makes it breeze with just 1 click it converts pdf to my excel file using some magic. I don't know how it works but it works crazy good and fast, love it. Cons: Obviously like any other software there is no 100% success. Sometimes it misses some blocks. And maybe add some more features. Pros: I'm a bookkeeper and from time to time, I need to work with a PDF of a bank statement and get that data into Quickbooks. I researched a number of programs that "read" a bank statement and turn that information into an editable .CSV (which can then be imported into QB). Some of the programs did way more than I needed, some were hundreds of dollars (perhaps worth the money if you need all of the features), and some required a less than intuitive set-up on my part. When I found PDF Tables, and tried a few statements for free, I was amazed at how easy, fast, and accurate their conversion was. Any of these programs require you to edit the .CSV after conversion, but PDF Tables was very accurate and the time I spent editing after conversion was minimal. Additionally, their pricing was affordable and scalable. Great product! Cons: So far, I haven't come across anything that I dis-like. I've run about 108 pages through their program and haven't experienced any glitches or problems. Overall: A real time and money saver! 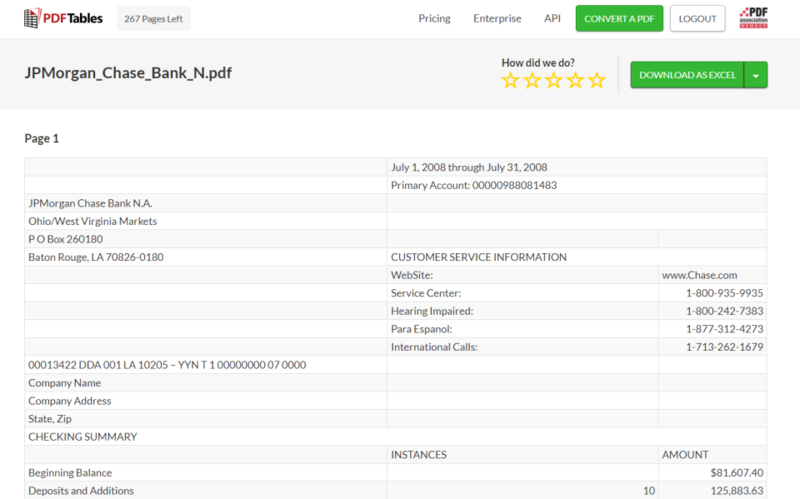 It makes working with a PDF bank statement much less of a headache than it would otherwise be. Thank you for the review Todd. We are glad our tool PDFTables saves you time and money :-) Happy converting! Pros: PDF tables is a great tool that saves time and effort for people like me who who are working data sheets that are saved in a PDF form. I like that this tool helps a lot when I convert my PDF files to excel sheets. It works really well and I have never had any issue with messed up tabs or formatting changes. Cons: There is nothing that I dislike. I really like the tool. Pros: I really like that PDF Table helped me a lot in converting many of my PDF docs that have a lot of tables into excel sheet without any errors at all. Sometimes I receive a lot of PDF docs from professors at school that has a lot of data in the form of tables and this was frustrating me all the time because I will have to copy every single cluster to a new excel sheet and type new formulas. But now I am so great that I don't have to do this again. 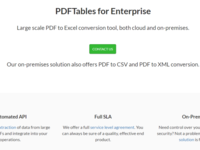 PDF Tables is a great software that saves a lot of effort and time. Cons: There is nothing that I dislike about this program. I just hope if the can make some discounts for students. Overall: So far it has been a great experience using PDF tables. I highly recommend it. Pros: I started to use PDF Tables recently but U can definitely say that it is easy to use and helps to save a lot of time and effort while working with PDF documents and it is also great for organizing my data and generating reports. Cons: Nothing so far that I don't like. It was recommended by one of my professors at school and solved my reporting issues. Thank you for your review. 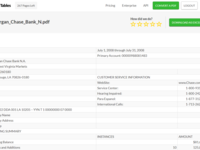 We're glad that we can help you with generating reports from PDF data. Pros: Easily converts important documents no matter the file type or size. Overall: It is a useful tool that helps achieve some aspects of document manipulation that other tools charge higher prices for. Hi Taylor. Thank you for the review. We do not limit the number of conversions that can be made in a certain time period. If you are getting hit by a limit, please email us and we can look into why this is happening for you (hello@pdftables.com). Please also note that we don't convert any file type, only PDFs. Pros: Really easy to use, with an excellent UI experience. Cons: Having used for over a month, I 've had no glitches with the software, so nothing to complain about. with no glitches or hiccups along the way.